We tangled on stars in the last class of 2018. 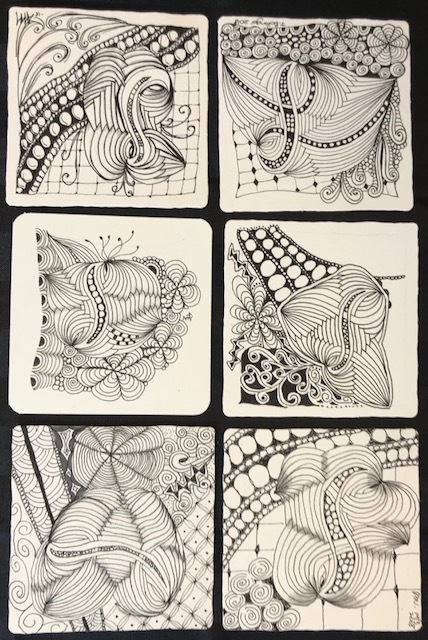 Thanks to everyone who has been part of the Zentangle journey in 2018. Looking forward to more in 2019. Thank you to everyone who attended the “Fresh from Providence” class. The tiles turned out beautifully with everyone’s individual style showing through! Many of you already know that I am planning a trip to visit the founders of Zentangle Maria Thomas and Rick Roberts in Providence, Rhode Island, in November. They are holding an event ZenAgain which is for Certified Zentangle Teachers to get together and learn new techniqes for their classes. I’m really looking forward to sharing with you all what I learn. So I’ve scheduled two Advanced Classes in November. For the dates go to the Workshops page. I will be leaving at the end of October this year and will keep you posted on my trip.